It’s fitting that just this weekend I spent my Saturday walking along Madrid Rio. Today Lindsey shares her top tips for discovering one of Madrid’s greatest secrets! When people come to visit Madrid, they usually stick to the big sights in the city center. You know which ones I mean: the Royal Palace, Puerta del Sol, the Plaza Mayor, and the Golden Triangle of Art. Most tourists, if they explore any green space at all, will likely go to Retiro Park due to its accessible location and popularity. Little do they know, they’re missing out! As one of Europe’s greenest capitals, Madrid has so much more to offer in the way of outdoor leisure spaces than just Retiro. 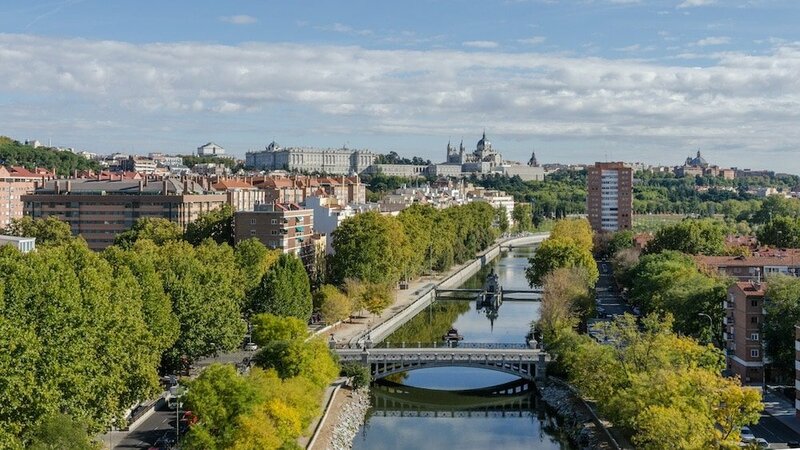 Head out of the city center towards the banks of the Manzanares River and you’ll find the aptly named Madrid Rio, a sprawling, stunning park spanning more than 1 million square meters. A favorite among locals since its opening in 2011, this space has it all: a whopping 17 specialty playground areas for the kids, dozens of bike paths and other athletic facilities, and even a manmade urban “beach” that opens in summer! Look beyond the glitzy new facilities, though, and you’ll see that this area is bursting with history in the form of monuments and miradores that few visitors know exist. 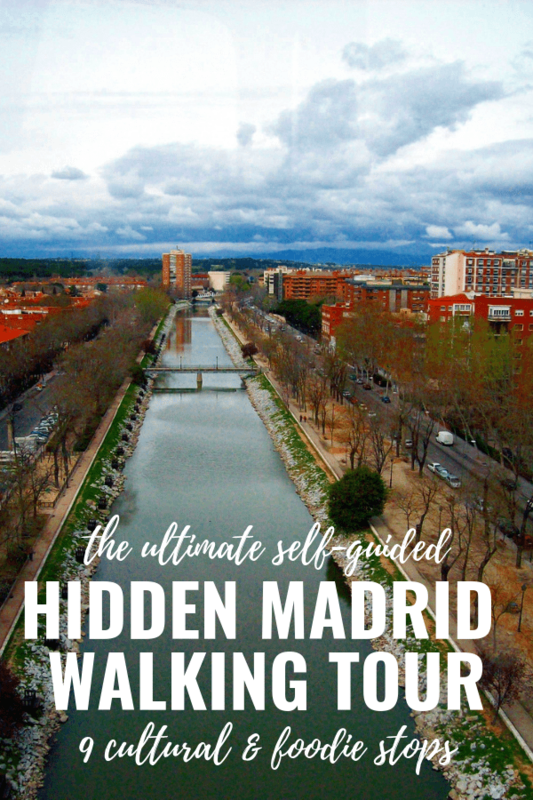 My self-guided walking tour of Madrid Rio will take you off the beaten path and into the heart of one of Madrid’s greatest natural and cultural treasures. And for the foodies out there, no worries—this route has you covered, too. Before starting your walking tour of Madrid Rio, you’ll need some energy, which comes best in the form of tasty Galician food. 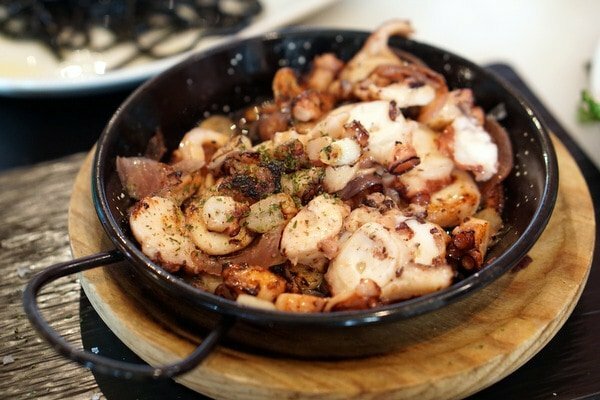 Head to Chacón and order up a few raciones to share: pork knuckle, pimientos de padrón, and their famous pulpo—the undisputed star of the show, said to be one of the best octopus dishes in Madrid. This tiny but atmospheric tapas bar doesn’t have much seating room, so grab a spot at the bar and eat standing up for the full experience. 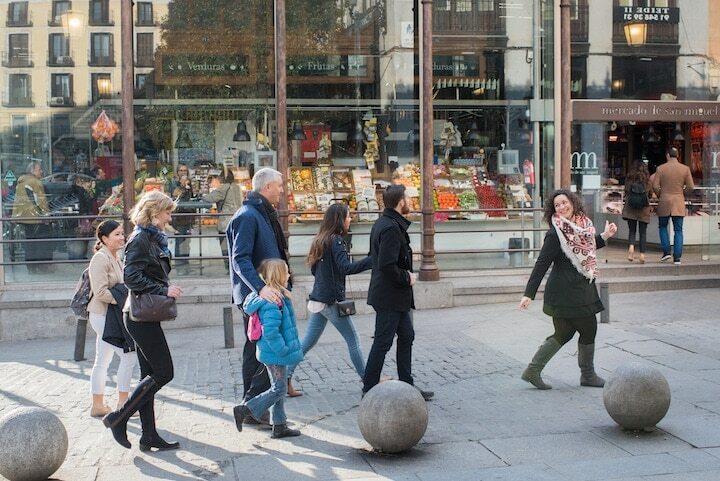 It’s now time to officially start your self-guided walking tour of Madrid Rio! First up: the oldest bridge in Madrid, dating back to the 1580s. 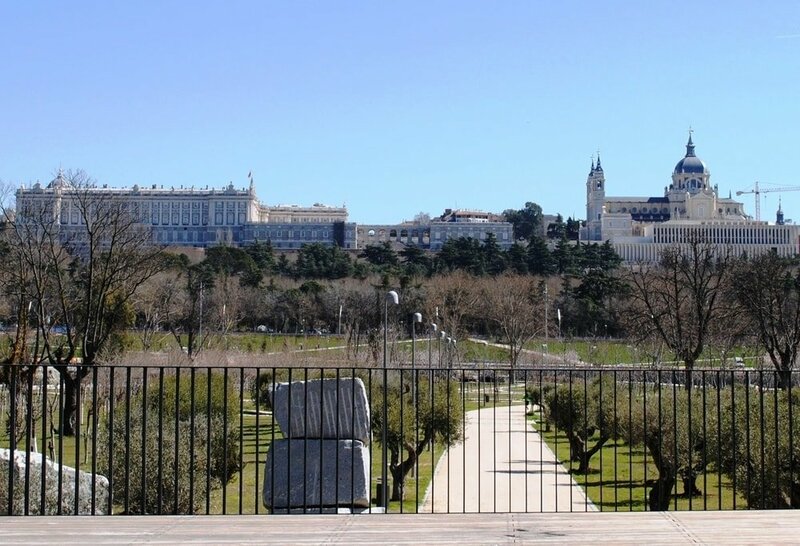 For centuries, it’s served as one of the main access points to the capital and offers gorgeous views of Madrid’s skyline and the surrounding park. Swing left after you cross the bridge and keep your eyes peeled for the Virgen del Puerto Hermitage, one of the most impressive of its kind in Spain, declared a cultural interest site in 1946. 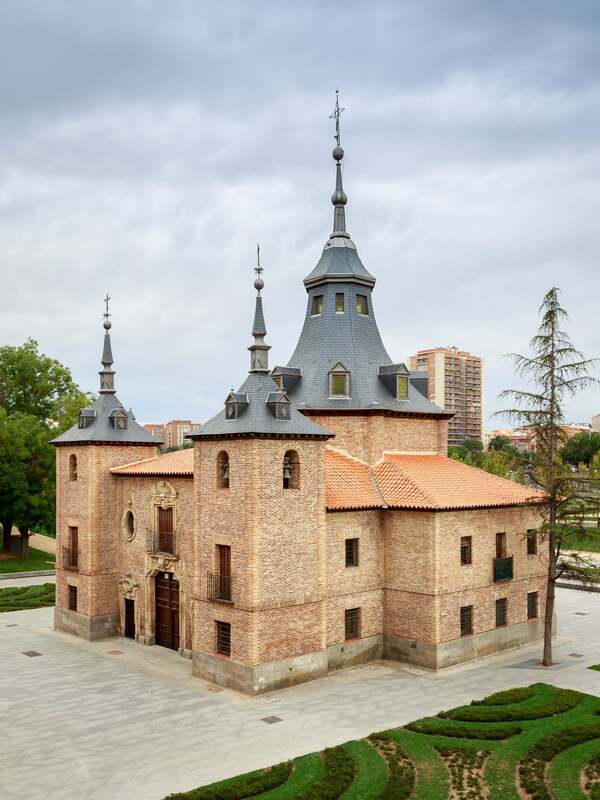 While this isn’t actually the original hermitage—the 18th-century building was pulverized during the Spanish Civil War, and the building we see today is a reconstruction from the 1950s—its grandeur and glory still make it worth a stop. After you pass the hermitage, continue a little ways further north until you reach the park of the same name: Parque de la Virgen del Puerto. This lovely little green space is a relaxing spot to enjoy a stroll in the fresh air. Seemingly worlds away from the busy city, it’s hard to believe that the park itself is actually just a stone’s throw from the M-30 highway! By this point, you’ve already covered quite a bit of ground on your walking tour of Madrid. About five minutes north on foot from Parque de la Virgen del Puerto, you’ll come across one of the most prominent names in Madrid when it comes to homestyle Asturian cuisine: El Urogallo. Founded by four food-loving friends from Asturias who now call the capital home, El Urogallo today is synonymous with down-to-earth, hearty, traditional food; friendly, professional service and a welcoming environment ideal for enjoying a good meal in good company. Asturian food is so delicious! See Also: Don’t miss Lauren’s complete Madrid gastro guide! Now that you’ve sufficiently refueled in the form of delicious Asturian bites, it’s time to continue your walking tour of Madrid! Next up: a bridge fit for a king. 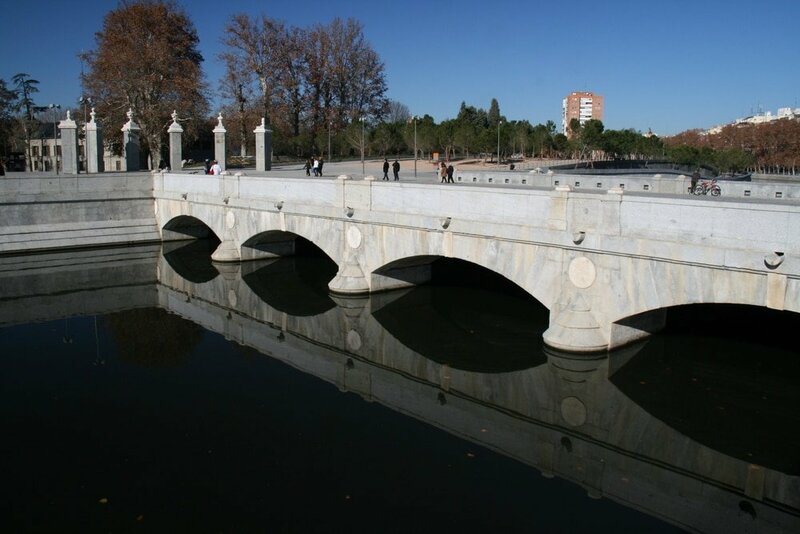 The Puente del Rey (literally “Bridge of the King”) was commissioned in the 16th century by King Felipe II, who wanted to connect the Royal Palace to the Palacio de los Vargas (we’ll get to that). Today, you don’t need to claim royal blood to enjoy a stroll across one of Madrid’s most emblematic bridges. Once you’ve crossed the bridge, it won’t be long until you reach the stately Renaissance villa known as Palacio de los Vargas. Originally constructed in 1519 as one of the many homes owned by the wealthy Vargas family in Madrid, it was purchased by Felipe II in 1562. The king then used it whenever he went hunting in the area that is today the Casa de Campo Park. It’s time for the final stop on your self-guided walking tour of Madrid. Just a little bit further west from Palacio de los Vargas lies Huerta de la Partida, a green space on the edge of the Casa de Campo Park that’s just as royal as the previous two sites. In the 16th century, Felipe II created these gardens as a place where royals and nobility could relax and get some fresh air close to the Royal Palace. It’s also home to a stunning viewpoint (mirador) of the same name, offering panoramas of the whole Madrid Rio area, the palace, Almudena Cathedral, and even the monument in Plaza de España. 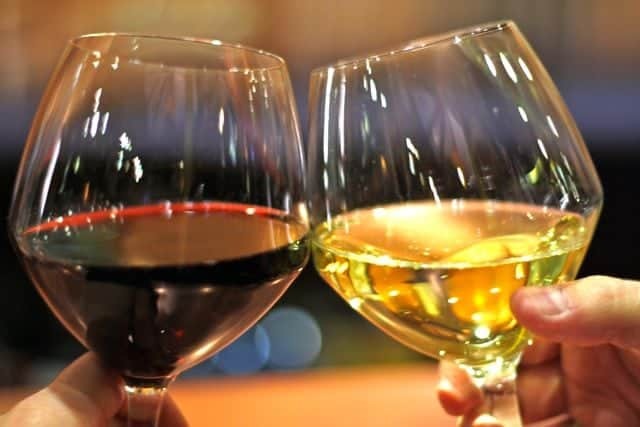 Now that your walking tour of Madrid Rio has come to an end, it’s time for one last foodie hurrah to finish off your experience on a delicious note. Head back across the bridge and make your way to Casa Mingo, where you’ll tuck into a hearty meal of the best roast chicken in Madrid, washing it all down with plenty of crisp Asturian cider. 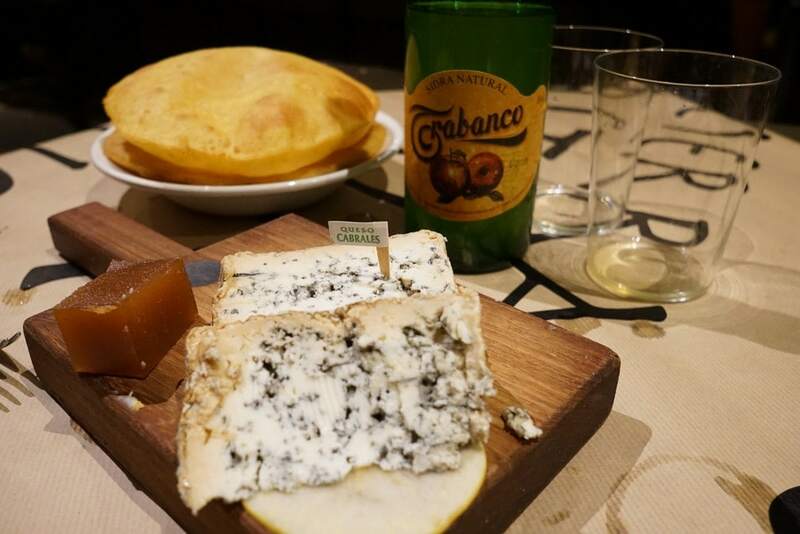 It’s the perfect meal after a day of exploring one of Madrid’s most treasured areas, and a favorite among local families. Hungry for even more delicious Spanish food? Check out Devour Madrid’s Ultimate Spanish Cuisine Tour, where you’ll discover the best of the best local cuisine here in the capital. You’ll get a crash course in eating like a local as you discover the dishes that have shaped Spain’s gastronomy, all at the places madrileños have known and loved for generations.